The Pull Bag goes AFTER DARK in Ep 09 of TPB AD we have several clips where TFG1Mike and other hosts talk about reacting to stuff that happens in comics! 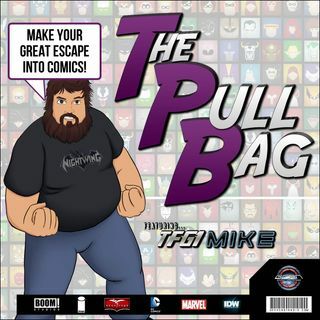 As always MAKE YOUR GREAT ESCAPE INTO COMICS with The Pull Bag only on The GeekCast Radio Network. #1 ARE YOU READING IDW's TRANSFORMERS COMICS? #2 HOW DID YOU REACT TO CAP SAYING, "HAIL HYDRA' ?? #3 WHAT WAS THE ONE COMIC EVENT OR WHATEVER THAT GAVE YOU THE BEST OR WORST REACTION?